Adamnan (625?-704), Life of St. Columba. [242K]. English translation, with an introduction. Also has a link to Book 1 and the first thirty chapters of Book 2 in Latin. 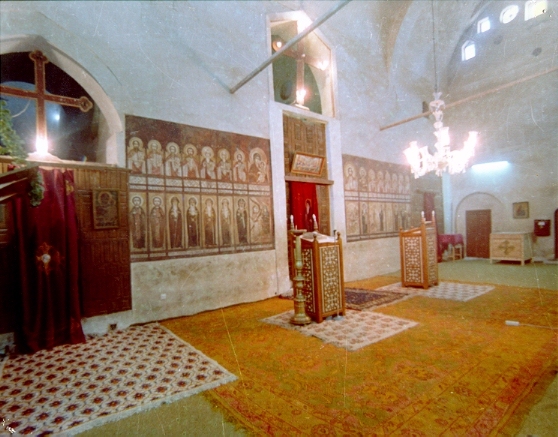 Bishop Maximos E. Aghiorgoussis, Monasticism in the Orthodox Church. The American Benedictine Academy. Local file. The Ancrene Wisse, also known as the Ancrene Riwle (c. 1215). In Middle English, edited by Robert Hasenfratz. Uses some Windows-only characters. This edition originally published by TEAMS in 2000. Bibliography on Women in Byzantium. Updated annually. Edited by Alice-Mary Talbot. [57K text, 36K graphics]. Herman (Marc) Blaydoe, Orthodox Monasteries of North America. Blaydoe is a member of the Carpatho-Russian Orthodox Church. 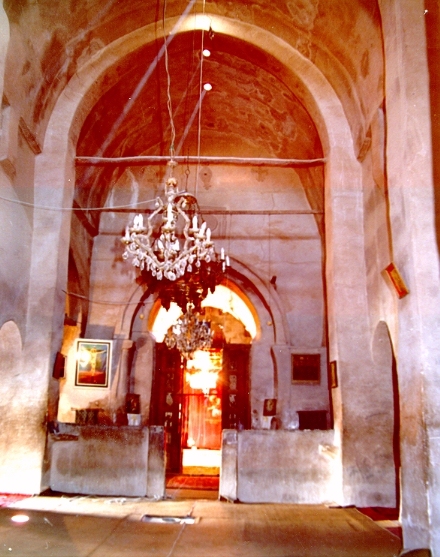 Images of Byzantine Monasteries. Assembled by Paul Halsall, as part of his site on Byzantium. The Celtic Saints. Many of them monastic. Directory of brief biographies compiled by Stuart Woodward. Éllopos: Internet Resources on Christian Asceticism. Not exclusively monastic, but many of the resources are pertinent to monasticism. Interesting collection of bibliographies, book reviews, and links to primary and secondary sources. "Modern" section is weak, though. Gregory of Nyssa (c. 335-c.395), Life of Macrina. [85K text, 11K graphics]. Macrina the Younger was the sister of Gregory and of Basil the Great, and presided over a double monastery. Mark Holdsworth, Carthusian Monks. [3K text, 56K graphics]. A personal account of contemporary Carthusian life. Letter XXII: To Eustochium (384). Very important, and very long-winded. [236K text, 1K graphics]. The Life of S. Hilarion. English. [64K text, 1K graphics]. Vie de saint Hilarion. French. [62K text, 21K graphic]. Life of St. Declan of Ardmore / Betha Decclain (5th C.?). [95K]. Moines Chartreux et moniales Chartreuses. The official home page of the Carthusians. In French, English, Spanish, German, and Italian, in that order of preference. Order of St. Benedict. Local file. SisterSite. Home page of the SISTER-L mailing list. Not exclusively monastic, but a wealth of resources related to women in religious orders, women's studies, feminism, spirituality. Theodoret of Cyr, Vie de saint Syméon le Stylite. [34K text, 27K graphic]. Aphrahat, Demonstration VI: Of Monks. (337). [111K text, 1K graphics]. Carta a Marcelino sobre la interpretación de los Salmos. Life of Antony. English translation. [138K text, 1K graphics]. Regel für die Gemeinschaft. German translation by Tarsicius Jan van Bavel. Règle de Saint Augustin pour les serviteurs de Dieu. [67K text, 131K graphics]. French translation by Raulx. Regla de San Augustín. Spanish translation. The Rule of St. Augustine. English translation. Basil (c. 329-379), Les règles monastiques. Both the "long rules" and the "short rules." 1969 French translation by Léon Lebe. Conferences. (426-428). (Complete table of contents, 67K). A much briefer table of contents for the Conferences can be found on the index page for Cassian's works. Both are local files. De institutis coenobiorum et de octo principalium vitiorum remediis libri XII (419-426). Institutes of the Coenobia, and the Remedies for the Eight Principal Faults. English translation by Edgar C.S. Gibson. Local file. Les institutions cénobitiques. French translation. Each book in its own file. Council of Gangra (between 325 and 381), Canons. 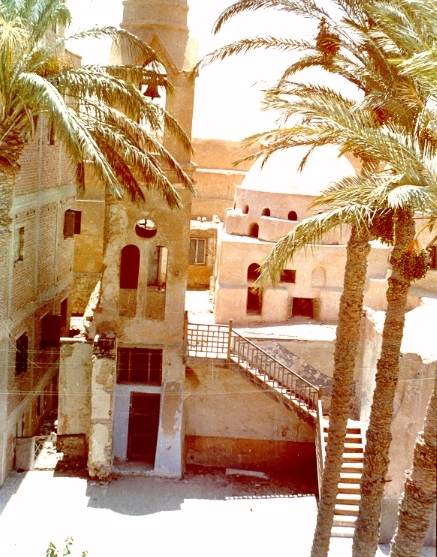 The History of the Coptic Language. Entrance, with mountains in background. [220K]. Entrance tower, seen from second-floor walkway. [188K]. 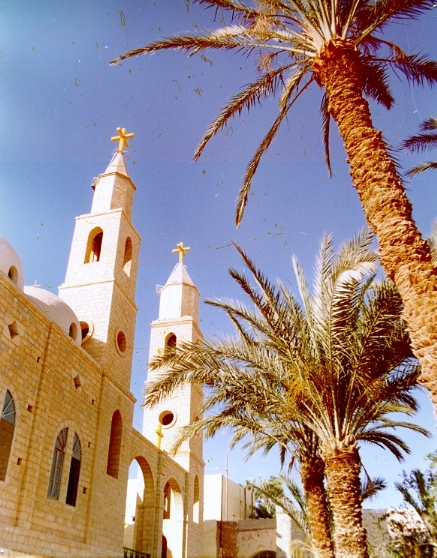 Towers and palm trees. [258K]. 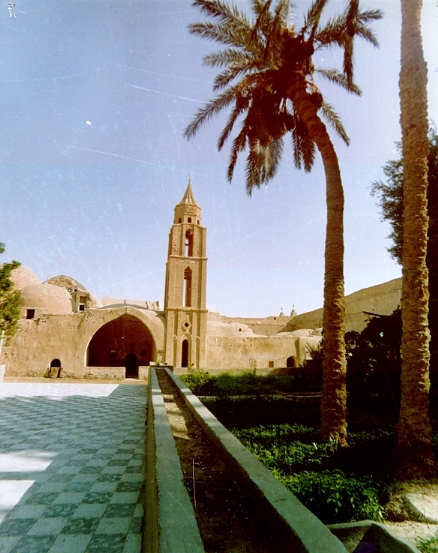 St. Mary and St. Yehnis Kama, also known as "the Syrian monastery"
Robert Oshana, Learn Assyrian Online. Aramaic alphabet, Syriac vocabulary. Must have graphics capability. Site also has .au files. [25K text, 36K graphics]. Palladius (d. c. 430), The Lausiac History. Excerpts. [128K]. 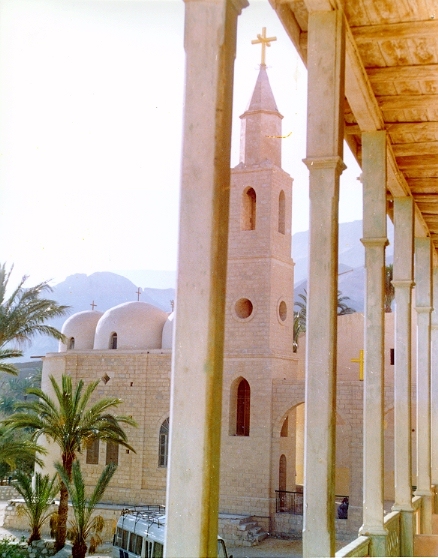 Paradise of the Desert Fathers (also known as Lives of the Desert Fathers , 4th C.). Excerpts from Norman Russell's translation. Regla de San Pacomio (c. 318). With St. Jerome's preface. 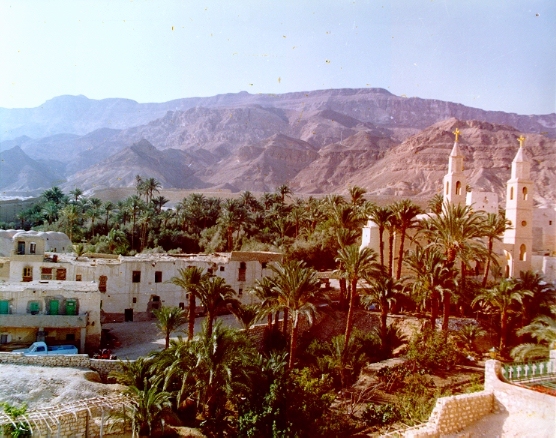 St. Catherine's Monastery (Jebel Musa, Sinai, Egypt). Handsome, informative page from the Ministry of Tourism, Egypt. [6K text, 98K graphics]. From the Sayings of the Desert Fathers (4th C.). Excerpts. The Life of St. Martin. Local file. Vie de saint Martin. [65K text, 26K graphic]. Vita Sancti Martini episcopi et confessoris. In Latin. Editor not named. With concordances and word frequency lists. Wadi Natrun Excavation Stills. 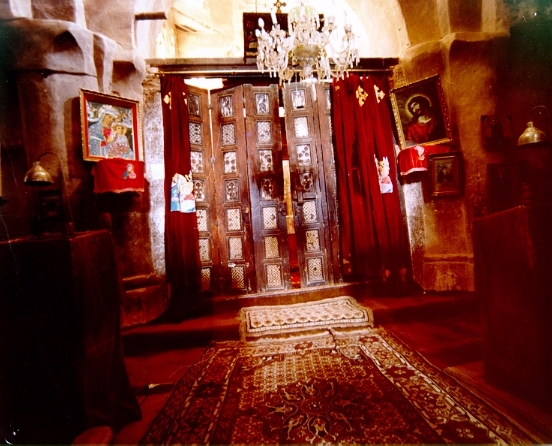 Photos of the monastery of St. John the Little (385). Gives details on file types and sizes for each page. Hasn't been updated since December 1995. Carta de Caridad, in Spanish. Charta Caritatis, English translation. Local file. Institut für Frühmittelalterforschung, Cluny - Projekt. Features two bibliographies, and a directory of "Cluny on the Internet." [4K text, more than 113K graphics]. Benoit Meslet, Le renouveau cistercien (XIe- XIIIe siècles). Some odd assertions (e.g., that Cassian was merely a translator and not an author), but, overall, a good basic historical introduction to the rise and decline of the Cistercians. The Rule of Benedict (early to middle 6th C.). Local file. With links to the Latin and translations in French, Hungarian, Italian, Spanish. Jeff Thomas, Welsh Abbeys. Photos, archaeology, architectural and historical information pertaining to medieval Welsh abbeys and priories. All ruined by the 16th-century Dissolution. Mostly Cistercian, but one Premonstratensian site as well. This web site also offers some information on Celtic Christianity, the "Age of Saints" in Wales, and holy wells. Conference 10: Second Conference of Abbot Isaac: On Prayer. (426-428). Local file. Conference 18: Conference of Abbot Piamun: On the Three Sorts of Monks. Local file. Conference 19: Conference of Abbot John: On the Aim of the Coenobite and Hermit. Local file. Institutes, Book 4, Chapter 39: Of the way in which we shall mount towards perfection, whereby we may afterwards ascend from the fear of God up to love. (419-426). Local file. [67K]. Livre ou traité de saint Bernard sur l'amour de Dieu. [131K text, 17K graphics]. French translation by Charpentier. On Loving God. Available in several file formats. Gregory the Great (540?-604), De vita et miraculis venerabilis Benedicti . Is Book II of the Dialogues (593-594). The Second Book of the Dialogues, containing the Life and Miracles of St. Benedict of Nursia. Local file. La vie de saint Benôit. French translation. [148K text, 145K graphics]. The Life of Our Holy Mother Mary of Egypt. [45K text, 55K graphic]. 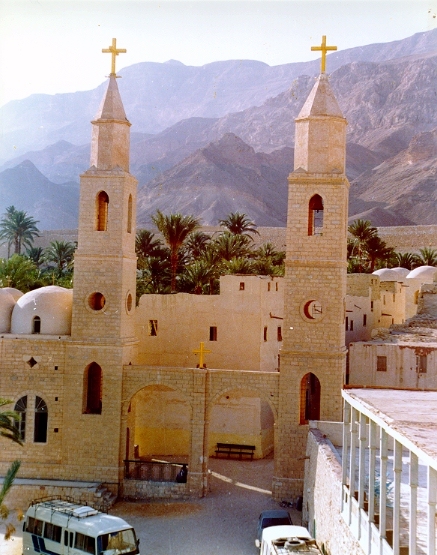 Vie de sainte Marie l'Égyptienne. [55K text, 35K graphics]. Regla de San Pacomio (c. 318). 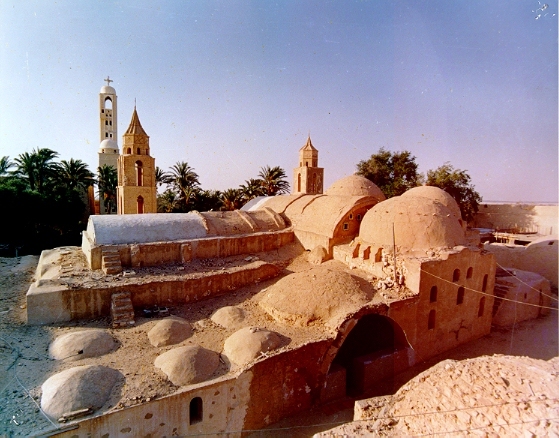 Vie de saint Abraham et de sa niece sainte Marie. William of St. Thierry (c. 1085-1148? ), Lettre ou livre aux frères du Mont-Dieu. Called the "Golden Epistle." French translation and introduction by Charpentier.